Alex Clarke at Denison Yacht Sales sends news that he's just signed the exclusive listing on the 2002 21.35m Mikelson sportsfisherman Avenger. Avenger is the most highly customized Mikelson ever built by the California-based shipyard and in 2012 the owner invested over $600,000 in a complete interior and exterior refit. 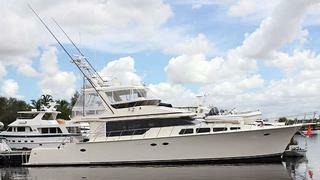 This included new electronics, full service of the engines, new watermaker, new exhausts, new running gear, new custom enclosure, new air conditioning units, new galley equipment and new carpeting throughout. Clarke says she is truly turnkey and ready to fish the world's oceans with her 2,000 nautical mile range. Avenger sleeps six guests in three en suite guest cabins including a full-beam master and is asking $1,499,000.